“Background: Cadmium (Cd), lead (Pb), mercury (Hg), and arsenic (As) exposure is ubiquitous and has been associated with higher risk of growth restriction and cardiometabolic and neurodevelopmental disorders. However, cost-efficient strategies to identify at-risk populations and potential sources of exposure to inform mitigation efforts are limited. The objective of this study was to describe the spatial distribution and identify factors associated with Cd, Pb, Hg, and As concentrations in peripheral blood of pregnant women. “Methods: Heavy metals were measured in whole peripheral blood of 310 pregnant women obtained at gestational age ~12 weeks. Prenatal residential addresses were geocoded and geospatial analysis (Getis-Ord G i * statistics) was used to determine if elevated blood concentrations were geographically clustered. Logistic regression models were used to identify factors associated with elevated blood metal levels and cluster membership. “Results: Geospatial clusters for Cd and Pb were identified with high confidence (p-value for G i * statistic <0.01). The Cd and Pb clusters comprised 10.5 and 9.2 % of Durham County residents, respectively. Medians and interquartile ranges of blood concentrations (μg/dL) for all participants were Cd 0.02 (0.01–0.04), Hg 0.03 (0.01–0.07), Pb 0.34 (0.16–0.83), and As 0.04 (0.04–0.05). In the Cd cluster, medians and interquartile ranges of blood concentrations (μg/dL) were Cd 0.06 (0.02–0.16), Hg 0.02 (0.00–0.05), Pb 0.54 (0.23–1.23), and As 0.05 (0.04–0.05). In the Pb cluster, medians and interquartile ranges of blood concentrations (μg/dL) were Cd 0.03 (0.02–0.15), Hg 0.01 (0.01–0.05), Pb 0.39 (0.24–0.74), and As 0.04 (0.04–0.05). Co-exposure with Pb and Cd was also clustered, the p-values for the G i * statistic for Pb and Cd was <0.01. Cluster membership was associated with lower education levels and higher pre-pregnancy BMI. “For decades, the science and policy narrative relating to the West African Sahel has focused on perceptions of overgrazing and human-induced desertification. More recent reports of regional-scale recovery (“regreening”) following the severe droughts of the 1970s and 1980s are sometimes ignored. 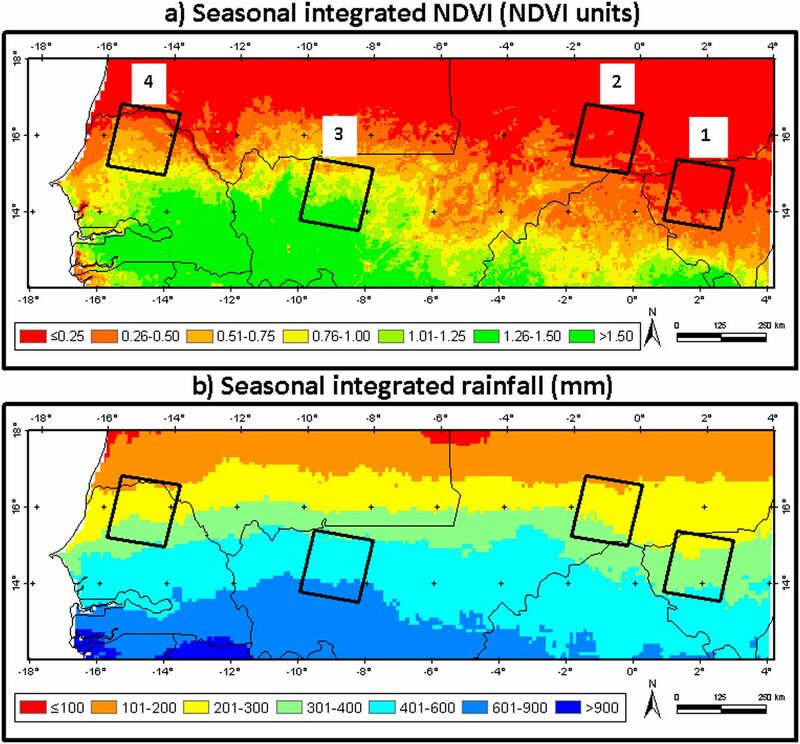 Averages of (A) seasonal iNDVI and (B) seasonal iR across the Sahel from July to October for the period 1983–2012. The figure also shows the location of the southwestern Niger , eastern Mali , western Mali , and northern Senegal  regions selected for further investigation. “Investigations of infectious disease outbreaks are conventionally framed in terms of person, time and place. 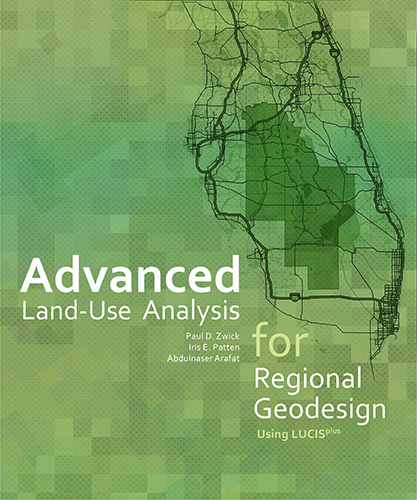 Although geographic information systems have increased the range of tools available, spatial analyses are used relatively infrequently. We conducted a systematic review of published reports of outbreak investigations worldwide to estimate the prevalence of spatial methods, describe the techniques applied and explore their utility. Esri invites you to present a peer-reviewed paper in a series of special joint GIScience Research Sessions for the 2016 Esri International User Conference. Papers in this special track must focus on cutting-edge research in GIScience. Full papers will be included in a special issue of Transactions in GIS to be available online before the conference. Abstracts (≤ 500 words) must be submitted to Dr. John Wilson, University of Southern California, by 15th November, 2015. The Transactions in GIS editorial team will review abstracts based on their GIScience content and select nine abstracts to become full papers. Notice of acceptance will occur by 1st December, 2015. Full papers (maximum 6,000 words plus figures, tables, and references in appropriate format for publication) must be submitted to Dr. Wilson for independent review by 9th January, 2016. Reviewed papers will be returned to authors by 12th February, 2016 and final manuscripts must be returned by 11th March, 2016, to be included in the special issue of Transactions in GIS. Abstracts should be submitted via e-mail with a subject line “Esri GIScience Abstract, Authors Last Name” no later than 15th November, 2015 to Dr. John Wilson, jpwilson@usc.edu. “Assessing patterns of fisheries activity at a scale related to resource exploitation has received particular attention in recent times. However, acquiring data about the distribution and spatiotemporal allocation of catch and fishing effort in small scale benthic fisheries remains challenging. Here, we used GIS-based spatio-statistical models to investigate the footprint of commercial diving events on blacklip abalone (Haliotis rubra) stocks along the south-west coast of Victoria, Australia from 2008 to 2011. Using abalone catch data matched with GPS location we found catch per unit of fishing effort (CPUE) was not uniformly spatially and temporally distributed across the study area. 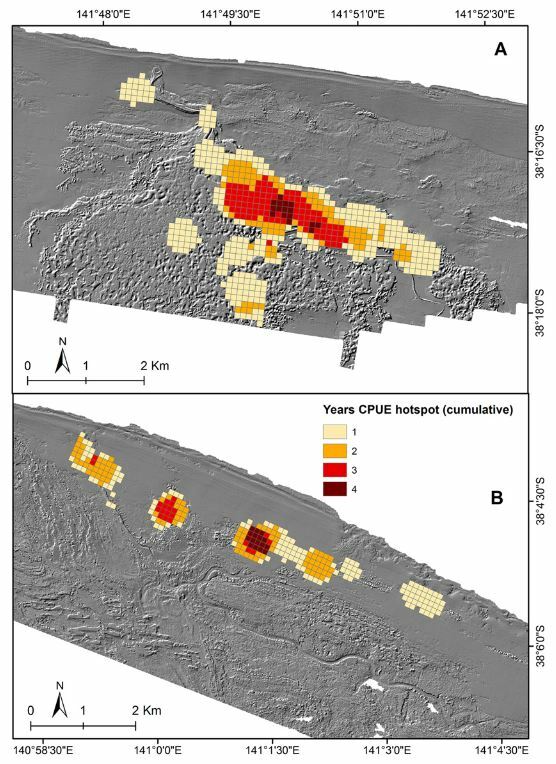 Spatial autocorrelation and hotspot analysis revealed significant spatiotemporal clusters of CPUE (with distance thresholds of 100’s of meters) among years, indicating the presence of CPUE hotspots focused on specific reefs. Cumulative hotspot distribution map. Cumulative CPUE hotspot map overlays (based on the number of years that CPUE was clustered) for (A) Julia Bank and (B) Discovery Bay over LiDAR derived hillshade.